Thousands of feet above sea level, an all-male community gathering in Kedarnath is discussing a proposed construction plan that violates environmental norms. “When pilgrims come here to meet their God, it is our duty to ensure their convenience,” says a young Hindu Brahmin, as he waxes eloquent about the benefits of building more shops and a hotel in the area. Mansoor, another youngster in the group, asks how this fragile Himalayan abode of Lord Shiva could bear the additional burden, and suggests instead that the number of visiting devotees be restricted each year to match the already available facilities. A tense argument ensues. “Where did you land up in our midst?” he is asked at one point. Mansoor looks nonplussed. “But we were always here,” he replies. It is the simplest of responses, yet carries a wealth of meaning in today’s India where the othering of minority communities has been mainstreamed and what is being said is deemed less important than who said it, their gender, their caste, their religious and regional identity. No faith is mentioned by name in this scene and much more is left unsaid than said in the conversation that exemplifies the essence of writer-director Abhishek Kapoor’s new film. 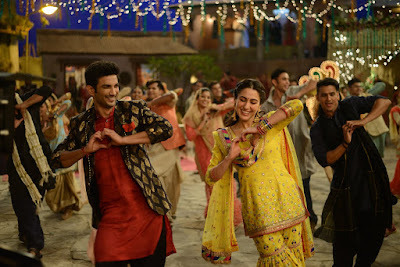 On the face of it, Kedarnath is a straightforward story of the love between Mandakini Mishra (Sara Ali Khan), the freedom-loving, rebellious daughter of a well-off Hindu Brahmin family, and the Muslim porter Mansoor Khan (Sushant Singh Rajput), set in one of Hinduism’s holiest sites in 2013, the year it was nearly destroyed by the flash floods that ravaged Uttarakhand state. However, like all Indian cinema’s most enduring inter-community romances, there is more to this one than what you see on the surface. The film is not just about eyes meeting, young hearts beating and pulses racing across religious divides. It is not even about emotional connects alone, though the bond that forms between Mansoor and his Mukku is sweet and touching. What it is about is true love, pure hearts, innocence and goodness in a time of bigotry, business interests and climate change. Was the objection to Mukku and Mansoor’s relationship used as an excuse to silence his open challenge to a potentially money-spinning construction project? Would Mansoor’s warning have been heeded if the public’s vision had not been clouded by the distrust whipped up against him on account of his faith, or would self-destructive greed have trumped all else – à la Henrik Ibsen’s An Enemy of the People – even if he had been seen as one of them? The screenplay simmers with questions that go way beyond its seeming elementariness. Mukku is a spunky girl, exasperating in her almost foolhardy wooing of Mansoor that makes one wonder if she is not aware from the word go that she is entering dangerous territory by pursuing him in this deeply conservative town. It is a foolhardiness stemming either from immaturity or the confidence that comes from belonging to a dominant community but not so far having realised what a privilege that is. Either way, unsurprisingly, the initial hesitation is all his. Perhaps the lure of the forbidden fruit did play a role in Mukku’s interest in Mansoor at first – she is, after all, a firecracker on a rampage against her patriarchal family when we are introduced to her. But as time goes on, she mellows down and feels a genuine connection with this essentially kind soul. Mansoor is guileless and sincerely committed to the comfort of his clients who he transports up to the temple on his horse or in a basket suspended from his head. Mukku is gutsy, funny, bright and committed to a cause that soon becomes his too. That they are intellectually compatible and both devastatingly attractive just makes the flame between them inevitable. Mukku is not the only brave one in this picture. At a time when Muslims in India are being marginalised and demonised like never before, sadly it takes courage to write a story about a Muslim youth who, quite literally, carries the weight of Hindu pilgrims on his back and lugs them up difficult terrain. 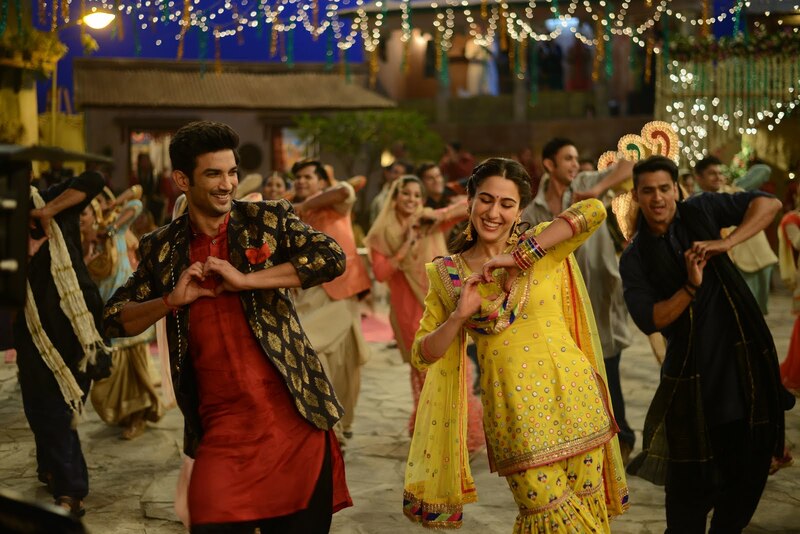 Kapoor and the co-writer of Kedarnath’s story, Kanika Dhillon (who gets solo credit for the screenplay and dialogues), are no doubt aware of the messaging in their visual imagery. It can be no coincidence either that they chose to name their heroine after the river running through Kedarnath. Mandakini means “the calm one” or “the slow-moving one” (our girl Mukku is neither) yet it was the raging fury of her waters that consumed the town during the natural disaster of 2013. Hindi cinema has featured several inter-faith romances down the decades, but until recent years, the trend has long been to write the man as the Hindu and the woman as the minority community member of the couple. Whether this has arisen from the makers’ own closet regressiveness or a desire to avoid the wrath of Hindu fundamentalists (who, like most conservatives, take a proprietorial view of women) is hard to tell, but Rajkumar Hirani’s PK (2014) has been among the few mainstream Bollywood films to swim against that tide. Kedarnath joins their ranks this week. That it has been released at a time when Hindutva forces are at their strongest and have (along with mindless mediapersons) normalised the ugly term “love jihad” makes it particularly special. For Kapoor, whose stellar direction gave us Rock On!! (2008) and Kai Po Che (2013), Kedarnath is a return to form after 2016’s lukewarm Fitoor. Dhillon, who delivered a terribly clichéd interpretation of a modern, free-spirited Indian woman in this year’s Manmarziyaan, comes into her own as a writer with this film. Despite the intense circumstances in Kedarnath, the film largely steers clear of loud melodrama. The scene in which Mukku watches without protest as Mansoor is beaten up in her home is one of the few that had no place in this otherwise believable narrative. DoP Tushar Kanti Ray’s sweeping frames of the pre-floods Kedarnath are breathtaking, never more so than with the camera’s dramatic forward movement in an early long shot of the temple town against the backdrop of majestic mountains. The cinematography and SFX are good for the most part during the floods too, though the occasional obvious fakeness of the SFX-driven turmoil is a letdown. In keeping with the spirit of Kedarnath, Amit Trivedi’s music is different here from his trademark sprightly tunes. Namo namo is a moving devotional number in Trivedi’s own clear voice. Even the comparatively bouncy Sweetheart is muted by the standards of songs like Gal mitthi mitthi bol from Aisha and Let’s break up from Dear Zindagi. What gives Kedarnath a further edge is the solid cast, toplined by the aching chemistry between the lead pair. Sara Ali Khan – daughter of Bollywood stars Amrita Singh and Saif Ali Khan, granddaughter of the legendary Sharmila Tagore – makes a confident debut as Mandakini a.k.a. Mukku. She is so convincing and endearing on screen, that it is as if she was born to live before a camera. Hers is the showier role, but Sushant Singh Rajput is no less impressive as the gentle yet fierce Mansoor. In that scene in which Mansoor sings Lag jaa gale to Mandakini, I found myself tearing up and willing the damned cosmos to unite the two hapless lovers. This is the natural order of things, the way the world was meant to be: men and women falling in love without social interference, humankind co-existing with the rest of the planet without interfering with the environment in the name of development and human welfare, so that no one gets to ask, “where did you land up in our midst?” because you see, we were all “always here”. Point well made, Abhishek Kapoor.